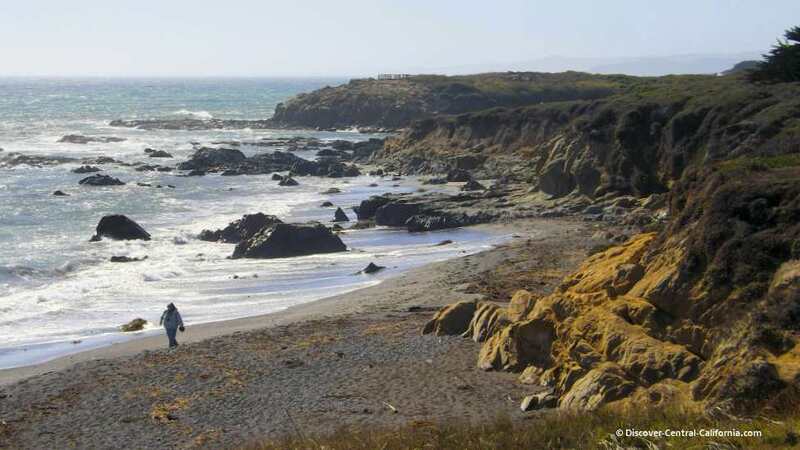 Moonstone Beach Cambria is a delightful spot along the California Central Coast. A bit less than two miles long it has most everything a visitor could want: A great beach, tidepools, boardwalk, picnic area, art galleries, lodging and restaurants. And all this is accomplished without any crowded feeling. A previous Photo of the Week selection. 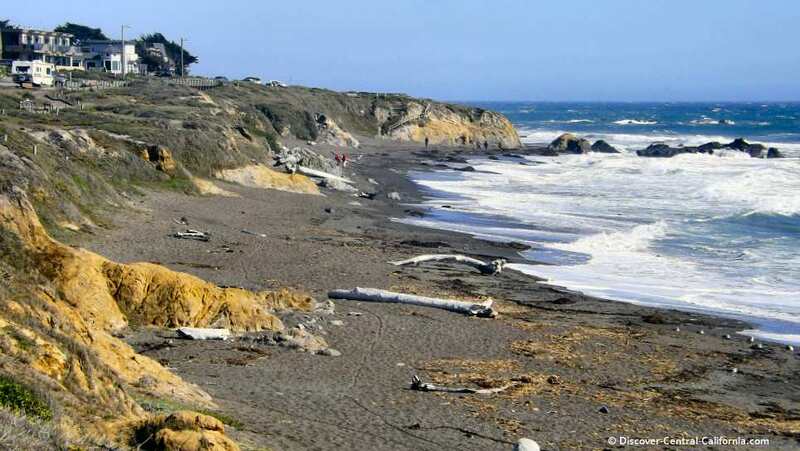 Moonstone Beach in Cambria typifies all that is good about Central California - great beauty of the natural surroundings with ample amenities and while popular, no large crowds. 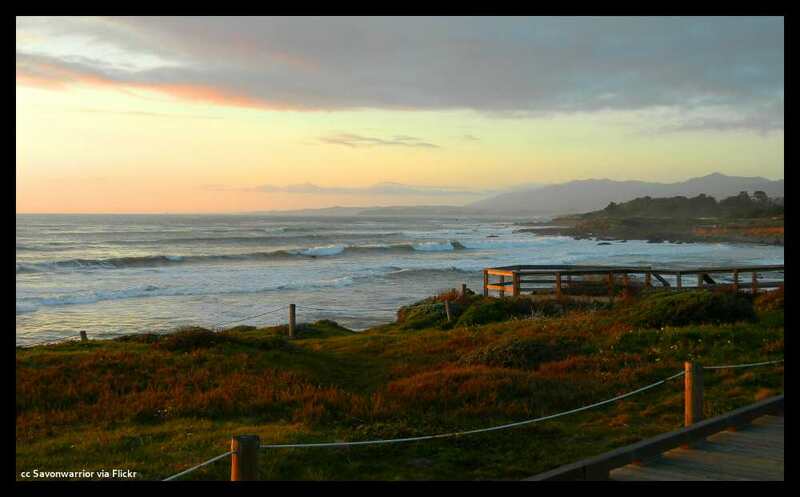 Tucked into a stretch of coastline no more than 1000 feet wide from Highway 1 to the surf, you never feel crowded. There are no buildings more than two storeys tall and the architecture is friendly and inviting. In the many times we have visited here, there has not been an instance where we couldn't find parking. All in all, this is an inviting beach. Parking: On the ocean side of Moonstone Drive and at two lots at the northern and southern ends of the beach. Accessibility: Good; wheelchair accessible restrooms at the southern end near Santa Rosa Creek. Accessible boardwalk extending nearly the entire length of the beach. This boardwalk is on a terrace above the beach. 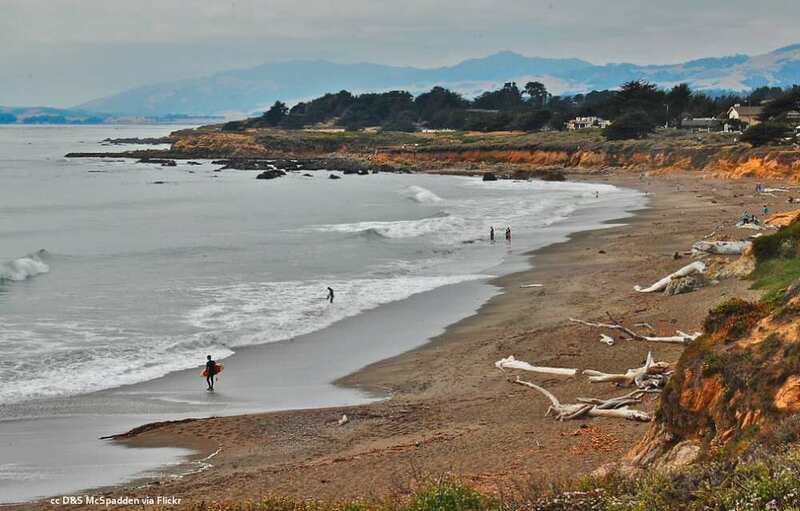 Organization: California State Parks Department; a part of San Simeon State Park; the coast and ocean here are also within the boundaries of the Monterey Bay National Marine Sanctuary. In the photo above, you can see the terrace above the beach on which is found the boardwalk. 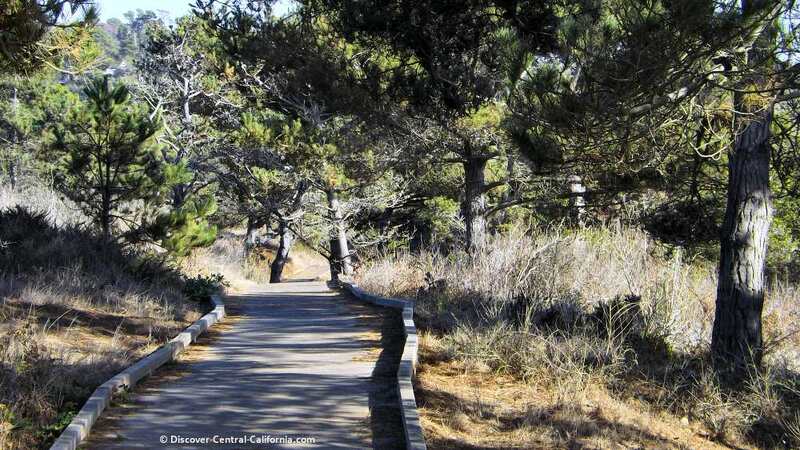 This well constructed walkway extends over a mile from south of the picnic area at Leffingwell Landing to Santa Rosa Creek at the southern beginning of Moonstone Drive. The beach gets its name from a particular chalcedony gemstone which is sometimes found here. It differs from the stone of the same name found elsewhere in the world. Downtown Cambria has a great little store which sells moonstone jewelry and their explanation of the stone can be found here. 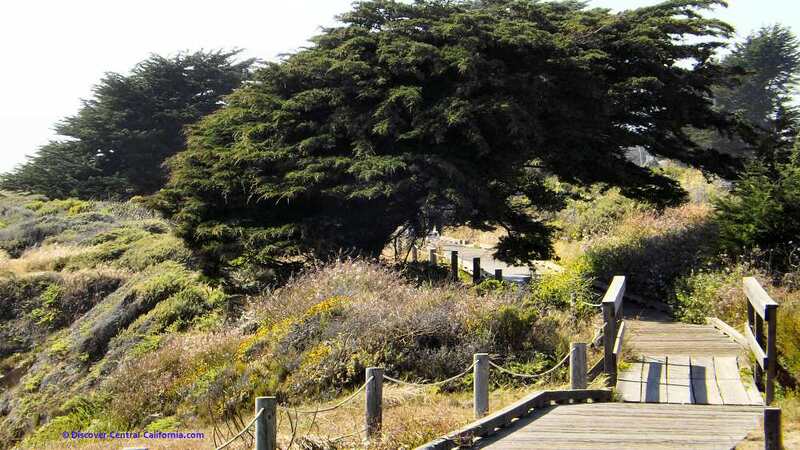 This boardwalk makes for a very comfortable walk and there are several places where it extends out to a point for a good observation platform. The following photo shows a view to the north from one of these and in the distance, you can see the Santa Lucia mountains rising as if out of the sea. That marks the beginning of the Big Sur coast. You can use the search box below to find out availability for any of the 17 lodging establishments along Moonstone Beach. Most of them have ocean views and some even have fireplaces, which is nice even in the summer being that close to the beach. 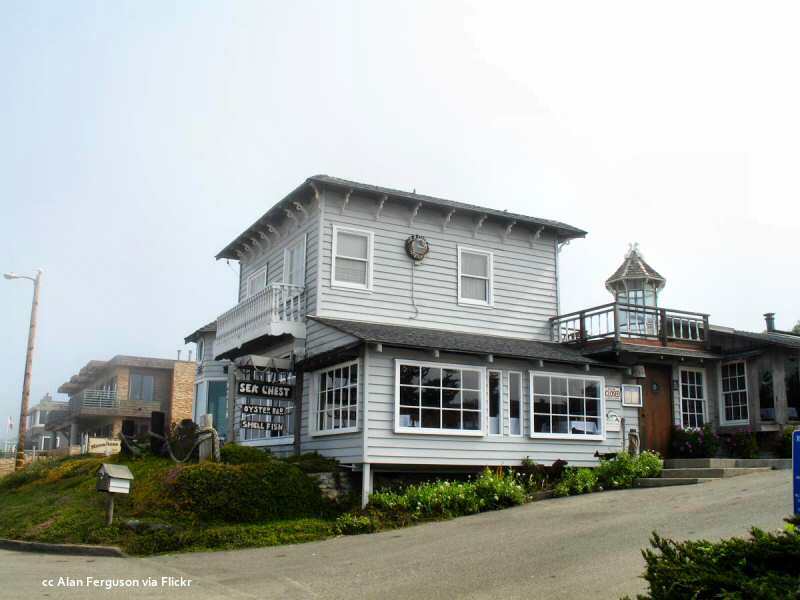 There are two fine restaurants along Moonstone Beach - The Moonstone Bar and Grill and the Sea Chest. They are both good and neither of them take reservations. The Sea Chest doesn't take credit cards either, so visit an ATM before dinner. The area shown here in the photo is sometimes full of people waiting for a table, but that is on the weekends and holidays mostly. It does tell you about the quality. 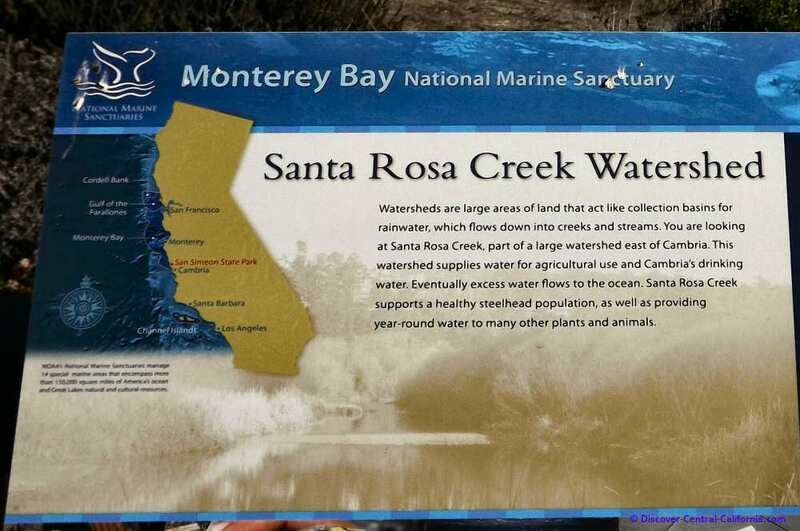 At the southern end of Moonstone Drive, Santa Rosa Creek flows into the Pacific Ocean. The boardwalk was recently extended along the creek and affords a nice shaded area for walking. There is a small dirt lot right near the El Colibri Hotel and a larger lot north of there with accessible restrooms. This latter lot gives you a good view of the creek and across to Shamel Park. Even if you are just passing through the area on Pacific Coast Highway, consider taking a little side trip along Moonstone Beach Drive. You will be well rewarded.